This special penthouse with exceptioanal views is located in a very tranquille area named Kargıcak town. 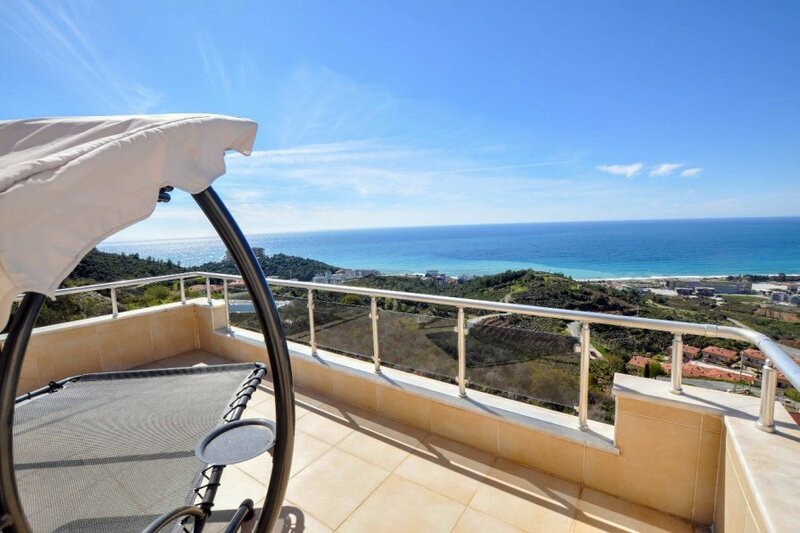 It is also close to famous Alanya city with the distance of 18 km and about 15 minutes by car. Quiet and natural atmosphere maintains a big opportunity for having time with family and friends in your special penthouse . At the same time you can utilize from the common facilities like fitness, table tennis and big swimming pool. Inside the penthouse up to 6 people can accommodate at the place. In this spacious penthouse you may take the advantage of sunbath in your balconies and enjoy the beatiful sunset in penthouse's huge terrace. Transportation is very easy from especially Alanya Gazipaşa International Airport or Antalya International Airport at the same time. From Gazipaşa it is only 15 minutes driving distance. If you also want to visit and enjoy the famous tourictic place Alanya, it is easy. Again in 15 minutes you can find yourself in Alanya's active city life and you can visit famous Kleopatra beach, Damlataş Cave and museum. Inside the city there are plenty of things to do and discover more ; such as waterparks, organic local bazaars, various kinds of restaurants/bars and many to count.